How much of a boost China's military will get this year is just one of many issues to watch during the rising power’s top-level political meetings that begin Monday in Beijing. Also in the crosshairs, a proposal to allow the president to stay in office indefinitely that is expected to win approval. In the run-up to the meetings, state media have been brimming with reports on military drills and defense firms have lobbied for more spending, highlighting the military’s growing strength and broadening outreach. China established its first overseas military base in Djibouti last year and its ambitions to play a bigger role globally are expanding. Over the past week, state media has released two reports about aircraft carriers, pledging to make them larger and nuclear-powered. China currently has only one aircraft carrier in service. The country’s first indigenously-built aircraft carrier was launched last year and is expected to enter into service in 2020. 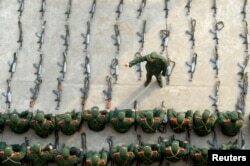 FILE - Paramilitary recruits listen to a briefing during a regular training session at an army base in Nanjing, east China's Jiangsu province. Communist Party leaders have long kept details of the defense budget a closely guarded secret, and analysts say the annual percentage disclosed at the meetings of the National People’s Congress is only the tip of the iceberg. Analysts tell VOA the disclosed amount could move back into the double-digit category this year. The disclosed increase over the past two years was around 7 percent. Alexander Huang, a strategic studies professor at Taiwan’s Tamkang University, said the increase is likely to boost alarm among China’s neighbors. “It’s expected to be raised against last year’s budget [at] closer to 10 percent due to their expanding activities overseas and new modernization projects,” Huang said. China’s military expansion may also indirectly accelerate collaboration among strategic rivals such as the United States and give more momentum to the Quadrilateral Security Dialogue (Quad) or the Indo Pacific concept, the professor said. Concerns about China’s global ambitions and tough stance on territorial disputes has helped breathe new life over the past year into the Quad, an alliance of Japan, India, Australia and the United States. Meetings for the NPC and Chinese People’s Political Consultative Congress, or the Twin Sessions, begin on Saturday and finish around mid-March. One key highlight of the meetings is the government work report, which will be delivered by China’s Premier Li Keqiang on Monday when the NPC holds its opening session. The report typically is watched for details and policy signals regarding the world’s second-largest economy. This year, it is being monitored to see how Beijing responds to Thursday’s decision by U.S. President Donald Trump to place steep tariffs on steel and aluminum imports. Trump has said a measure will be signed next week approving tariffs of 25 percent on steel and 10 percent on aluminum. Some believe the move could be the opening salvo in a trade war between the world’s top two economies. Even if the topic does not come up in the work report, it is likely to be persistent on the sidelines. During the meetings, it is widely expected that the former head of the Communist Party’s graft watchdog will be appointed vice president. Wang Qishan, 69, was originally expected to retire when he stepped down late last year, but is now expected to be Xi’s point man in handling relations with the United States. Analysts said Wang’s return is a good thing. “Wang Qishan is portrayed in China itself as a firefighter. So, wherever there’s a thorny issue or a big problem. Wang Qishan was the man to go to for the rescue. I think it’s a smart move,” Huang said. As China’s vice president, he will be able to reach out to senior U.S. officials, including President Trump, although Sino-U.S. trade dialogues will remain a tug-of-war on the road ahead, he added. China expert Lin Chong-Pin agrees. “Wang Qishan is known to have a lot of ideas, even some tricks or whatever, not the orthodox approach to problems. So, appointing him will solve a lot of problems others cannot,” he said. Others note that since Wang has Xi’s full trust and has seniority, he will be a steady hand in helping to handle Sino-U.S. relations. International governments and regional neighbors will be watching closely for clarification on a controversial proposal to amend China’s constitution and end the president’s two-term limit in office. That move – which would allow Xi Jinping to stay in office indefinitely – has sparked a backlash online and abroad, prompting protests in Hong Kong, and raising concerns that already pervasive controls over society and on the Internet could worsen. Furthermore, it embarrasses China and the top leader himself, argues Li Datong, a veteran journalist who has penned an open letter to voice his strong opposition to the proposed amendments. “China will become a laughing stock among the world’s civilized countries. 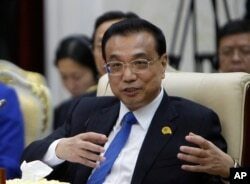 Making things worse, world leaders may turn cautious about or guarded with Xi Jinping, putting him on a par with the likes of (Russian President Vladimir) Putin,” Li said. 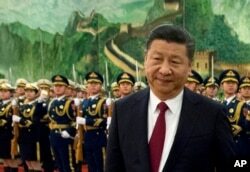 State media deny the move means Xi will become president for life, but censorship of the topic and any online discussion about it has done little to ease concerns.